Captain’s Log. Stardate: See above. I awoke next to my humble little Explorer, the BugJumper, in a Space Station. It had been a long time since I last journeyed into the stars, but a recent protocol update, Atlas Rises, spurred me to continue the journey. My Mission? To return to the world where I first awoke in the Euclid galaxy, which I named Buline. A garden world with lush green blades of grass, forests of red, floating semi-sphere islands of rock, and benign wildlife and Sentinels. A lot had happened since I started that fateful afternoon. 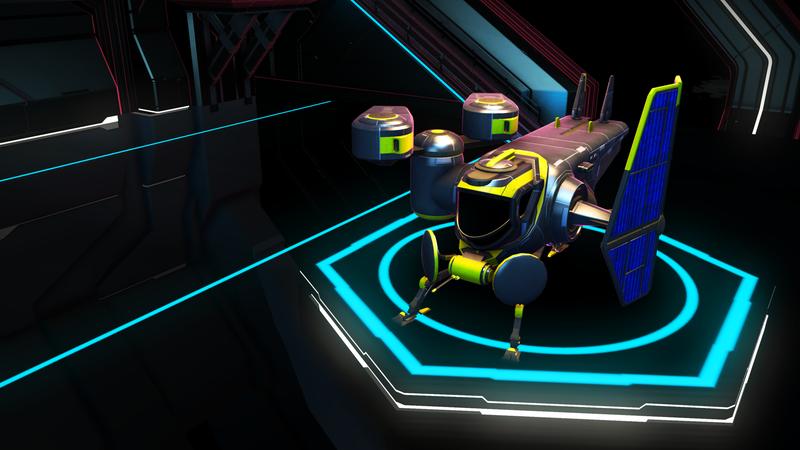 I completed the path of the Atlas, during which I found the BugJumper, a silver and yellow little number with two offset thrusters on one side and a solar panel on the other, my constant companion. I fully upgraded her Hyperdrive to help take me to the center of the galaxy, and we had many fun adventures together, discovering strange new worlds, taking Black Hole shortcuts, and even making a parody video based on Star Wars. Eventually, the Update known as Foundation allowed me to build bases and explore worlds with Exocraft, and it was then that I first started my journey home: I wanted my first Base to be on Buline. However, all the Black Hole jumps I had made were one-way trips, so to get back I would have to take the long route home. With a fully upgraded Hyperdrive I could make jumps measuring nearly a thousand light years, and along the way I took on Bounties and even saved a couple of Freighters. Eventually however I picked the wrong fight and the BugJumper was downed, taking Warp Reactors Tau and Theta with them. This severely limited my ability to return home, so I decided to rest at a Space Station. The Atlas Rises Update, issued a year after I first awoke, renewed my vigour and I decided to once again venture forth for Buline. I hopped into my ship and immediately ignored the annoying boops of my new Starship Communicator; whoever was calling would have to wait until I returned home. I departed the Space Station and used the Galactic Map to plan my next move. My journey back home began anew. The Atlas Rises Update revamped the Galactic Map, and now provided a readout showing how far away Buline was. After comparing the distance and the range of my Hyperdrive, my heart sank: Buline was 75,000 lightyears away, and my Warp Drive could only take me 200. Unwilling to make 375 jumps to get home, it was clear that I needed to expand the range of my Hyperdrive jumps. Freighters, available to buy since the Foundation Update, come with Hyperdrives that have ranges of 7-900 lightyears as a base. However they cost in the tens to hundreds of millions, so my only option was to restore Warp Reactors Tau and Theta, extending my range back to over 800LY. Each required a unique material, Fungal Mould for Tau and Solanium for Theta. Thanks to the Foundation Update, I was now able to tell what materials a planet has, making finding a world with Solanium a cinch. Once there however, I discovered that the same Update also made it such that I couldn’t gather either material without a Haz-Mat Gauntlet. After skimming through the Update Notes, I learned that I would need to set up a base and be given this item from an Armourer. This was annoying as I had intended to lay down my first base once I arrived at Buline. Begrudgingly, I found a nice garden world to set up shop for the meantime, and named it Augustus as it looked rather like a golf course. After recruiting an Overseer, a Scientist, and a Technician for good measure, I finally recruited an Armourer and he gave me the Haz-Mat Gauntlet. A particularly odd bug happened along the way that had my base floating high above the ground, but it was nothing my Jetpack couldn’t take care of. See what I mean by it looking like a golf course? After accustoming myself to the crafting loop of making Warp Cells, I started by looking for Solanium on a particularly arid world. With the new Scanner boost from the Atlas Rises Update, finding the material was much easier than it had been previously, as they were marked with purple diamonds with a white gold bar inside. I found a few of these icons underground, and went to investigate. In the caves I found an Albumen Pearl, a highly valuable item. In my carelessness, I took one, and was immediately at Threat Level 3 for the local Sentinels. After downing several of them, it became clear that I would not be able to deter them and resume my Solanium search, so I reloaded my last save at the nearby Trade Post, making a mental note not to take any more of those damn Pearls. It was quick to gather both the Solanium and Fungal Mould after that, and with Warp Reactors Tau and Theta restored, I was ready to resume my quest. I stopped off on a rusty crimson garden world and used the Beacon to peg down four Drop Pods, and after cashing in my Discoveries, I fully upgraded my Exosuit to 48 slots! With a couple more jumps following the blue line back to Buline, my ship’s readout told me that my day’s progress took me down to 69,000LY. That was more than I thought! Touching down for more Warp Cell materials. I conclude today hopeful that I shall return to my homeworld and set up a loving base there, however rumours that the Atlas Rises update may have changed it put me in a disturbed but undeterred mood. I began today by immediately crafting five more Warp Cells before setting out. The first world I scanned had Albumen Pearls on it, so I avoided it lest I invoke the wrath of the Sentinels. The desert world I came upon happened to have little of the Plutonium or Thamium9 I needed to craft Warp Cells, but I eventually got what I needed. As I left however, I came under attack by pirates wanting my Warp Cells! I wanted to prove that I wasn’t the same schmuck whose defeat put him off his adventure for half a year, and with the help of some on-the-fly shield repairs and some allied fighters, I was able to defeat all three assailants. I like to imagine the local Vy’keen were very impressed when I traded in my Tropheum. My first Warp Jump of the day went uneventful and as planned. However when checking the Galaxy Map on the second, I saw that the line my ship’s computer had plotted out for my return home was now completely off, pointing to stars that didn’t exist, let alone that it didn’t connect to my current location. Jumping to a system closer to the plotted line resolved this issue, but it’s worrying that I have to waste Warp Cells on this. My navigation’s tomfoolery happened again on my fourth jump of the day as well. Visual evidence of Nav Computer tomfoolery. This early stop resulted in me finding a truly special world, one that I named Monobreak WC900. While innocuous from orbit, inspection closer to the ground revealed that the world was littered with tall, aged blocks of stone (or metal, I’m not quite sure) floating in the air. All of them were broken in one end, as if they were panes of glass shot by a blaster and immediately frozen in time. An eerie ambience filled the air, sounding as if a Freighter was being torn apart in slow-motion by an unknowable force. Among them I found giant circular rings; clearly made by one of the established races, their suggested function nethertheless reminded me of the Monolith Portals I came across during my original venture. Surprisingly it had an Atlas-like terminal at its base, the data within suggesting that the Sentinels were sent to eradicate life on this world sometime in the distant past. It felt troubling just seeing the Sentinels ignore me. Unfortunately, while there was plenty of Iron, Heridium and Plutonium around, Monobreak contained none of the other resources needed for the Warp Cell loop like Zinc and Carbon, so it was with a heavy yet grateful heart that I had to depart. But not before leaving a little message for any other Travellers who happened to stumble upon this world. The next planet turned out to not be much better; even on the night side it had scalding heat that made quick work of my Thermal Shields. On the way to the third and final planet in this system, I got an alert about a pilot with a bounty on his head; despite my newfound confidence, I was not foolish enough to go and attempt to take on a Three Star rated fugitive. Instead, I took on the fighters that attacked the Freighter in the next system I warped to. The Captain, Oar, called me up to the bridge and gave me some supplies in thanks, including 36,000 Units, Antimatter and a Warp Cell! To end the day, I make a couple more jumps to use up my remaining Warp Cells before resting at the next Space Station. I still don’t believe my Scanner when it says these things are docile. Got into the Warp Cell grind once again. This garden world had a creature that looked like a mix between a Raptor and Satan, but luckily it was docile. Upon leaving I got a notification of a fugitive like yesterday, but despite my efforts to ignore him, he came to me and attacked. I was left with no choice but to respond in kind, and luckily my large stockpile of Iron meant that my Shields were always topped up. I did so well in fact that I decided to take on the next two Bounty notifications that came my way immediately after! Unfortunately the Galaxy Map still proves to be a constant issue with the Waypoint lines. It’s now become expected that the line to follow isn’t where it’s supposed to be, and I now jump to the closest star to its current endpoint rather than actually following it normally like it expects me to. This will become a large waste of time considering how many Warp Cells I need to expend and not even travel as far as I’m expecting to. Whilst gathering resources for my second Warp Jump session, I got scanned by pirates for the valuable cargo I had. Turns out that leaving Warp Cells lying about your inventory and not putting them into your Hyperdrive makes you a much more desirable target! Fortunately, these scavengers don’t have the bite or shielding that Fugitives do and all three went down like chumps. I made a few more jumps after that, however Thamium9 remained a tough element to find so that I can craft my Warp Cells. It seems that I’ll be hampered to getting a scant few from asteroids or a scant few from plants on certain worlds. I wonder if there are places where Thamium9 plants are more common. A few days ago I decided to include a Word of the Day, which lists a chosen word that I learnt that day in one of the three languages: Gek, Korvax or Vy’keen (and sometimes Atlas). Some are thematically appropriate, while others, like today, are simply amusing to me. The first world I explored had little Thamiuim9 on it due to its geography consisting of small islands. The second world wasn’t much better thanks to hostile Sentinel behaviour that I wasn’t willing to put up with. The third world however, an icy one, contained Thamium9 in much more frequent quantities, so I’ve made a mental note to explore ice worlds when I need Thamium. The first system I jumped to today had me reunite with Nada and Polo. While I still have not completed the Path of the Atlas, I remained true to my goal of returning to Buline, no matter the condition it was in. Still, it was good to see them again. I also once again saved a Freighter from attack by pirates, and its Captain, Opeys, graciously rewarded me with Units, Antimatter and a Warp Cell. While scrounging a radioactive world for Zinc to craft Antimatter with, I came upon a Monolith trial. Whilst I couldn’t understand most of what it said, I managed to pick out the word Oxide, which was enough to correctly answer the trial (which makes sense, as I was asked to plug a hole that was leaking alien goo from the rock). T-Rex size? Raptor arms? SCORPION TAIL?! Yeah, this guy was rated Predator. To finish the day, I found a Desert World and used a Signal Booster to pick out some Drop Pods. I fully upgraded my Technology slots in my Exosuit, however I found that the Cargo portion can hold more than four slots! They’re the most expensive, so I have my work cut out for me! I think this guy was directing other ships onto the landing pads? My usual Thamium9 mining session got off to a rocky start today. Two of the three planets were islands and so constant takeoffs and landings would be an issue. My only option was to head back to the desert planet with the killer T-Rex creatures, who mostly come out at night, mostly. On my second jump, the Mission line in the Galaxy Map did a weird route, like a loop-de-loop! The second leg of today’s journey took me to a lovely little garden world that happened to look a lot like Buline did! The main difference is that the colours were inverse: the grass was red while the trees were green. When I warped to the next system, the nearby garden world was also similar to Buline! It wasn’t as lush and was far more hilly, but it had the odd floating islands I remember from Buline. The other major difference was that the Sentinels were extremely aggressive, so I named the planet Hostile Hill Zone. My journey today was very progressive, if mostly uneventful. I managed to travel 2/3rds of the way back home in a matter of five days, an incredible amount covered considering my initial expectations. I do very much look forward to seeing my homeworld again. Even the Mission line seems to have stopped bugging out on me and reliably aids me on my way back to Buline. I’m so excited! Had a blunderous moment today whilst gathering more Thamium9. I forgot to put my Warp Cells into the Hyperdrive, so of course whilst flying across to another planet I was attacked by space pirates. Defeating them was simply, but it was all for naught as the Sentinels were very hostile! Augh! The pain kept on coming where, after exploring a wonderful little garden world, I decided to jump to a new planet. I got distracted and I collided directly with the Space Station, sending the BugJumper into a tail spin. I think even the Korvax were laughing at me from inside. Wasn’t even worth it either, the planet I went to had hostile Sentinels again! I hoped for better luck with the next world, and that didn’t exactly happen either as it had heavy rain for weather. I very much enjoyed the views on the world despite the inclement weather, however. I once again warped into the middle of a pirate raid on a Freighter, one which looked remarkably like a Star Destroyer. I cleaned them out and Captain Enyevo rewarded me with the usual Credits, Antimatter and a Warp Cell, for which I was very grateful! As I get closer and closer to Buline, I’ve begun noticing that the flight line is taking more consistent and extreme pitch changes. This is probably it trying to guide me to the specific location of Buline’s system, Solana. EDIT: And right as I log that, it freaks out again. Atlas help me. This guy was so freaking annoying! Today I decided to, alongside the usual Thamium9 upgrades, put a little time into expanding my Tech Slots to put in things like environmental shielding. It’s been a constant source of frustration so hopefully this will help alleviate these issues and free up more room in my Inventory for storage. My Tech slots are fully upgraded to twelve, and I’m also working on the Cargo upgrades. No idea what their slot cap is! But today something significant happened, outside of the usual mileage. Whilst exploring a toxic world for more Thamium9, I spotted an Explorer craft that looked remarkably like the BugJumper. The major difference was that it has two solar panels, one on each side. As much as I love my current BugJumper, I always felt that it looked odd with those weird side-thrusters on one side, and I have always wanted to have a symmetrical one as far as the solar panels are concerned. Having the new one would also allow me to take advantage of its Tech slots; since the BugJumper predates the Atlas Rises update, all of my tech such as weaponry, Pulse Drives and Hyperdrive upgrades are in the General Inventory section, taking up places I could use for cargo. Eventually, she landed. She was a B-Class ship, so had +3% Shields and +20% Hyperdrive, and she even had my favourite number, 22, emblazoned on the side. My computer told me that her value was just over 1 million units, but the Korvax owner, Chief Scientist Entity Ini , was selling it for half that. Considering I had 3 million Units in my wallet, the purchase was obvious, and I flew away in the Asebonco S88, soon rechristened to BugJumper II. With that out of the way, it was time to get the BugJumper II back into shape and to the standards I left the original craft in. This would require a great many materials, including Copper, Nickel, Gold, Iridium, Frost Crystals, Chrysonite, and of course, Fungal Mould and Solanium. Chrysonite was the main one I was worried about, however a quick trick to the Galactic Trade Network terminal on the local Space Station provided me with the amount I needed. A veritable fleet. I was so confused. Things got interesting when I got out and found another craft of the exact same design only with a few extra slots. It wasn’t much more expensive than the last one so I bought that guy too. Then a third one showed up, a C Class with worse stats that the pilot was giving away for free. Then a FOURTH one touched down, also identical, but also with slightly worse stats than even the first one I bought, for which I was grateful. Upon exiting the Space Station, I did a Scan of the planet I initially found the first BugJumper II and, to my delight, the readout informed me that it had both Gold and Nickel! Perfect! I quickly gathered the resources for a Photonix Core plus Pulse Jets Sigma and Tau, which increased my Pulse Engine range and manoeuvrability, and crafted them into the new Technology section of my Starship. I also put Cannon Damage Sigma and Tau there as well. This guy looked even better, especially with the spherical windshield, but her stats couldn’t compare to BugJumper II. Next came the Hyperdrive, which gave me flashbacks to the start of my journey. Dynamic Resonators are complicated to craft, so I cut to the chase and bought the six I needed for all three Hyperdrive upgrades. On my way to the next world, I was scanned by a Pirate for my Dynamic Resonators, but with a strategy of jumping as close to the nearby fleet of Frieghters as possible meant that I had the backup of many other Starships in the system, and he went down quickly. The system I was in contained an icy world, which provided me with the Frost Crystals needed to crash Warp Reactor Sigma. However, while another world contained the Gold I needed for Warp Reactor Theta, the system did not contain an arid world, so I was unable to acquire any Solanium, and decided to continue towards Buline and hope to stumble upon a desert world along the way. I did eventually find one. Or so I thought. Turns out there’s a difference between Cactus Flesh and Solanium! Along the way I yet again defended another Freighter (who was partially inserted inside the local Space Station) and was rewarded by Captain Asnok. Thanks to my new damage upgrades to my Photon Cannons, the attacks went down like butter. I did eventually find an arid world with Solanium, and with that done it was back to the journey to Buline! I was very pleased with the Hyperdrive range of the BugJumper II, as it can now go over 1000 light years! As you can see in the stats below, I went a great distance and I am very proud of my progress today. I should be able to make it back to Buline tomorrow! Got back into the usual Thamium9 grind as I headed into the home stretch, and even saved another Freighter along the way (thanks for the reward, Admiral Ich!). As I get closer and close to Buline, I’ve stopped intentionally overshooting the Custom Waypoint guideline in the Galaxy Map as I don’t want to go past it! And then, completely unexpectedly, it was there. The Custom Waypoint guideline in the Galaxy Map ended on the Solana system marked by blue Destination brackets. I had made it. I was home. I tapped the screen to make sure it wasn’t on the fritz, and warped to the system. It’s even a Korvax system still! Buline was hidden behind one of the other planets, and I immediately scanned it. It had undergone major changes. No longer a lush world with green grass and red trees, it was now a Glacial planet named Ficerioint Jalpa, and was completely unrecognizable. When I double-checked Buline’s Waypoints in my Discoveries database, all of their thumbnails had been corrupted and distorted. I entered its atmosphere to take a closer look. To my surprise, the actual geography of Ficerioint Jalpa was incredibly similar to Buline; it had rolling hills, valleys, small mountains, and even the floating semi-circular islands of rock. It even had Iridium blocks! Touching down, the readout had the familiar limited Sentinel levels, rich flora and fair fauna, although the wintry weather betrayed those similarities. My Discoveries database even updated the old Buline entry to now read Ficerioint Jalpa. To my utmost surprise, most of the creature on Ficerioint Jalpa were the same as on Buline back in the day! I think I left the air-con on last time I left. I decided to leave Jalpa behind and see if there was another world in Solana I might like to establish as my new home. One of them, the convolutedly-named Odgotovshi Anhout, was a Verdant planet with Star Bulbs, Cymatygen and Iridium. It looked nice enough, but whilst I was observing the readout, I was attacked by a pair of pirates who were after my Lemmium. With a passionate urge to defend my home system, I shot the pair of them down with vigour. The convolutedly-named planet turned out to be the world I had previously called Visceria for being a toxic hellhole with vicious wildlife and crazed Sentinels. It was now a lush tropical paradise, with relaxed Sentinels, wet yet sunny weather, and choked with animals. Luckily only one is predatory and is easy to spot. With that, it was settled: this would be my new homeworld, and I renamed it Buline II. Searching for a new Base. I placed down a Signal Booster and fired it several times to mark down some options for my new Base. I found one that was surprisingly close by, and I could not ask for a better location. It was on a large island, located quite close to two nearby waterfronts, and had a fantastic view of the three other worlds in the system in the sky. I entered the base, named it Teletraan-1, and sat back in my pilot’s seat, satisfied that I had come all this way and found a great new home.